Pilgrims may have walked from the market square to the monastery this way. The timber framed gateway was built in the Tudor period, and was the entrance to the burial ground of the church of St. Cross which adjoined the Cathedral. The path continues parallel to the Cathedral and past the ancient STEEPLE GATEWAY. Pilgrims may have walked from the market square to the monastery this way. 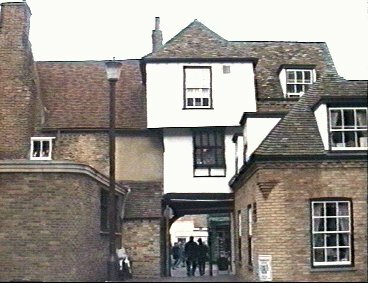 The timber framed gateway was built in the Tudor period, and was the entrance to the burial ground of the church of St. Cross which adjoined the Cathedral.